If you take gaming seriously then you know that a gaming PC itself isn’t the only thing that matters. Some other necessary staff includes a comfortable gaming mouse and a pad for it, and a good gaming desk with a comfortable chair. You will also need a top-notch gaming monitor for a lifelike image, which often comes with built-in speakers. But if you can’t imagine gaming without high-grade sound then you will start looking for a gaming headset immediately. Obviously, the whole list of gaming items mentioned above may cost you a fortune. Thus, to save your money and time we offer you the list of the best budget gaming headsets that will let you enjoy a gaming process to the full and at the same time won’t bankrupt you. Before you start choosing the gaming headset we recommend you to look through the key principles of a successful purchase. How to choose the best of the lot? Is a chosen item a perfect match for me? What features should I always consider before making a final decision? The answers to these questions and many others can be found below. Do you need a headset with complete noise isolation or are the surrounding sounds important to you? Depending on these preferences all headsets are divided into two types – open and closed. Open headsets let you hear what is happening around you while you are playing games. Still, it doesn’t mean that the sound quality is poor. 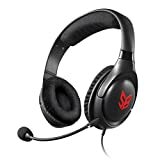 Open headsets, as well as closed, can offer vivid and lifelike audio but this type of headphones is more suitable for busy gamers who need to be aware of the surrounding sounds as well. But if you prefer a complete plunging into the world of games then closed headset is something you should choose. This kind of headphones includes noise isolation which excludes any surrounding noises that can interfere with a gaming process. If you don’t belong to the category of people who get nervous when seeing tangled wires then you can choose something from the list of wired headsets. In fact, they have their own advantages over their wireless brothers. Unlike wireless headset, this one won’t make you suffer from unpredictable connection drops because it guarantees a robust connection which is important for gaming. As to the wireless headsets, they were designed for those who can’t stand cables and prefer comfort. Choosing this type of headsets you should always pay attention to its battery life which usually differs from model to model. Whatever cool headset you have it costs nothing if it isn’t compatible with your gaming device. Thus, one of the first rules you should follow when choosing headphones is to check their compatibility. Modern models usually support plenty of connection types. Still, be attentive if you have an old device as it may need an adapter. By the way, lots of wireless headsets can also turn into wired as they may include an extra cable. Sound quality is a key issue for plenty of customers who even agree to tolerate cables if the headset delivers amazing audio. The best way to choose a high-quality headset is to test it. So, if you have a chance to wear the headphones and feel the accuracy of its sound and check its noise isolation level you won’t have any problem in making a right choice. Most of the budget gaming headsets have a stereo sound which let you know which side the sound is coming from. Some of the models provide a surround sound type which is aimed more at the particular sounds and noises of the game. Streaming games presuppose teamwork. In such case, your headset should be equipped with a high-quality microphone for clear and accurate sounding. All built-in mics can be divided into two types – omnidirectional and unidirectional. The first kind of microphones delivers not only your voice messages but also all surrounding sounds. Still, your voice will sound more natural via this kind of mic. As to the unidirectional type it blocks most of the noises coming together with your voice. The drawback of the latter one is that your team may hear your breathing as well. Budget gaming headsets do not mean poor build quality. Of course, if you want to have a robust headset that will last almost forever get ready to spend a pretty penny on it. Cheaper models can’t boast of superb build quality but you can select the most durable one among them too. Choose the headphones, the construction of which is made not only of plastic but also includes some steel or metal elements. Besides, always check the quality of cables that come together with wired headsets as well. Your headset must be comfortable. Say no to any discomfort. Spending hours when playing games should feel like a sheer pleasure but not a punishment. Cushions form, texture quality, sweat resistance – these are important points to consider when choosing the best budget headset for gaming. One of the best options is to buy headphones with memory foam ear cushions as they will adjust to your ears perfectly well. Note that if you wear glasses, you should also look for a glasses-friendly headset to feel comfortable when playing games. Remember that your comfort means your health. Need a lightweight and flexible headset? 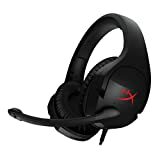 Lucky you are as HyperX has designed Cloud Stinger headphones which, besides being affordable, have also got the list of other pros that will make you think of buying it. This gaming headset is equipped with 50mm directional drivers for accurate sounding and noise-cancelling microphone for clear communication. What is more, it’s one of the most comfortable cheap headsets as its earcups come with memory foam and intuitive volume control. Looking for something really cheap? Logitech G430 is one of the headsets which cost less than $50 and at the same time can offer some good options. These headphones are designed with X and Dolby 7.1 surround sound that guarantees immersive audio every time you put them on. Comfort is another feature this gaming headset can be proud of. Logitech G430 is light, has soft earcups and can swivel up to 90º. As well as HyperX model mentioned above this one is provided with a noise-cancelling microphone to make your voice always sound clear. Unlike Logitech G430 ASTRO A10 can boast of its robust build quality. This headset has a durable anodized aluminum headband that comes with a damage-resistant polycarbonate blend. In addition to this, such durability is also comfortable as ASTRO A10 is equipped with convenient memory foam ear-cushions to make you feel great even after playing long hours. Though its microphone is omnidirectional it includes the flip-up mute function and in-line volume control. Note that this headset was designed specifically for gaming and its sound quality was adjusted to these needs too. ASTRO A10 delivers accurate and vivid sounds with low latency. Tired of plastic? Razer Electra V2 is designed with lightweight aluminum frame and means reliable performance at any stressful game sessions. There is also Virtual 7.1 surround sound for precise and lifelike performance. Razer Electra V2 is provided with custom-tuned 40mm drivers and that’s great news for those who like deep bass. By the way, these budget headphones are compatible with such devices as PC, Mac, Xbox, PS4 and Mobile. 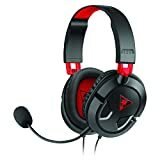 These stylish headphones for gaming attract lots of customers because of their well-known Corsair build quality and are one of the best headsets for gaming. Due to metal construction, HS50 is one of the few budget models that can boast of long-term durability. Thanks to memory foam its earcups are very adjustable to customers’ physical peculiarities. Another feature that makes Corsair HS50 a comfortable headset is its removable microphone. If you need top-notching sounding for your games you will put your bookshelf speakers aside and will start searching for a gaming headset with high-quality audio. One of the best options for a reasonable price in such case is Turtle Beach – Ear Force Recon 50X. This headset costs less than $50 and is provided with 40mm speakers that deliver good performance with crisp highs and lows. Ear Force Recon 50X has an adjustable and lightweight body with in-line controls. By the by, there is also a high-sensitivity microphone for clear communication with your teammates. Another budget headset for gaming is Logitech G230. It comes with noise cancellation and on-cable sound controls. Thanks to its soft earpads and lightweight design you won’t get tired after wearing it for several hours. Note that they are made of sports performance cloth that is not only comfortable but also breathable and washable. Keep in mind that these headphones were designed namely for gaming purpose, so you will enjoy all the accuracy of gaming stereo sound. Logitech G230 has also got a foldable microphone and is compatible with different platforms including Linux OS. Razer Kraken is a gaming headset that will impress you with its immersive sound. It is designed with advanced 7.1 virtual surround sound engine that makes everything sound vivid and true to life. It’s equipped with a removable microphone to deliver your voice messages at a high level. This headset is also comfortable in use and supports PC and Mac via USB. This gaming headset was designed to make you feel comfortable during the game and enjoy immersive sound coming from its earpads. Creative Sound Blaster Blaze comes with 40mm full-spectrum drivers and plush velvet earcups. Its lightweight and cushioned construction will take care of your comfort. Creative Sound Blaster Blaze has a removable microphone with a noise-cancelling feature for delivering precise and clear voice messages. Besides, there is in-line remote for volume and mic control. Don’t be afraid to choose a budget headset for gaming. Lots of high-grade items are affordable nowadays as their price is coming down, and that’s a chance for you to get something really special for a reasonable sum of money.